The focus of this packet is FORM. Discuss and compare the difference between 3-Dimensional FORM and 2-Dimensional SHAPE (especially with 3rd grade). SHAPE has height and width. FORM has height, width and depth. You might choose a project that uses SHAPE instead of FORM. A Gargoyle can be created on a flat sheet of paper by cutting paper SHAPES. This Gargoyle is flat when compared to the real 3-Dimensional FORM of a Gargoyle sculpture. If you choose to create a Gargoyle sculpture with some type of clay, point out how the “pictures” of the Gargoyles, shown in the Presentation, are 2-Dimensional (have only height and width), while the Gargoyle Sculptures themselves, as well as the sculptures the kids will create, are 3-Dimensional (have height, width AND depth). Some people have reported that the sand clay recipe is crumbly and won’t stick together. This only happens if you don’t let the mixture boil long enough to finish the chemical change produced by the heat. Be sure the mixture comes to a GOOD BOIL (for at least a minute) before you turn off the heat! This clay makes realistic looking gargoyle sculptures! Since gargoyles were placed on Medieval Cathedrals, a stained glass window or Rose Window project would also be appropriate. Cathedrals are covered with stained glass and stained glass is full of COLOR. The artworks in this Packet are sandstone sculptures, all created in the same gray tones, so stained glass gives volunteers an option to discuss COLOR with this packet. 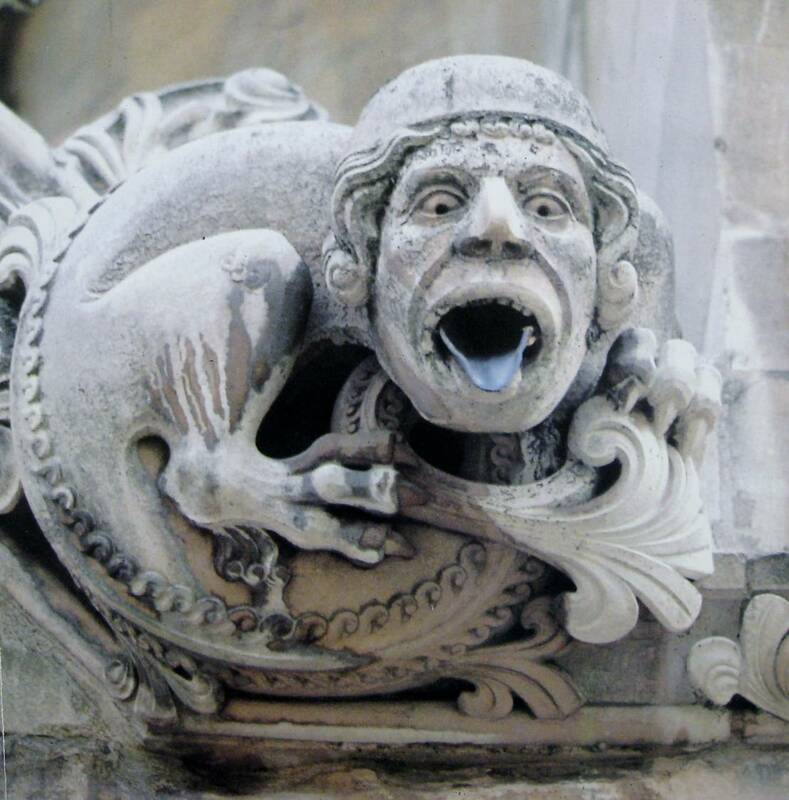 The term “Gargoyle” comes from the French word “gargouille” which literally means “waterspout”. 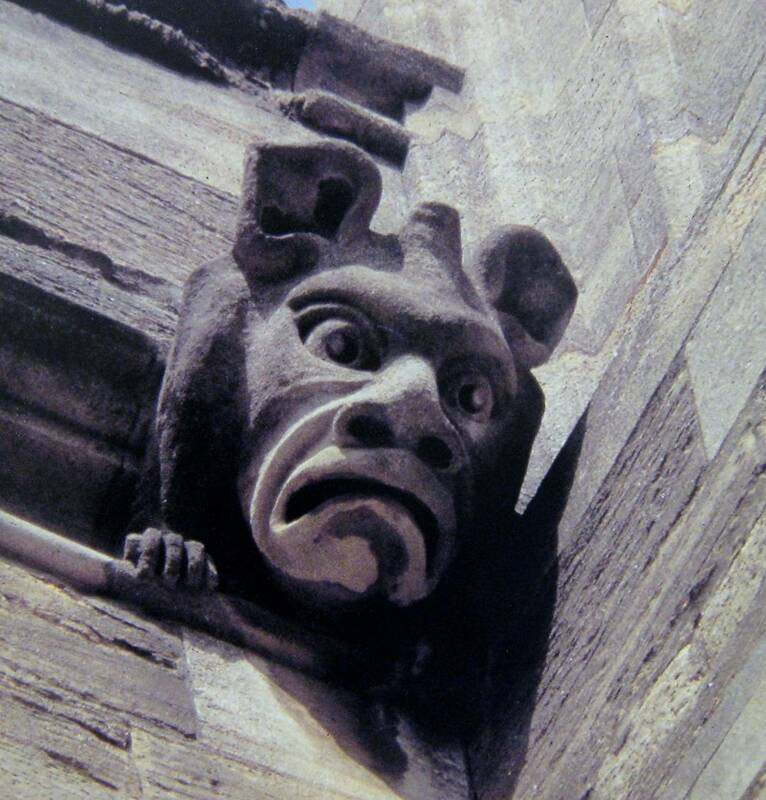 In Harris and Lever’s Illustrated Glossary of Architecture Gargoyles are defined as “spouts in the form of a carved, grotesque human or animal head projecting from the top of a wall, to throw off rainwater”. World Book Encyclopedia defines them as “a decorated waterspout that projects from the upper part of a building or tower to protect the building walls from rain water running off the roof”. WHAT DOES A GARGOYLE LOOK LIKE? Because most Gargoyles are waterspouts that stick out from the side of a building, they usually have long necks. These waterspouts keep rainwater from eroding the masonry (stone) walls of Romanesque and Gothic buildings or cathedrals. They work like rain gutters on houses today. Troughs cut into the backs of these creatures remove rainwater from the roof that then exits through some point of the Gargoyle—usually through the mouth. Waterspout Gargoyles are usually found on the highest buttresses of the building. 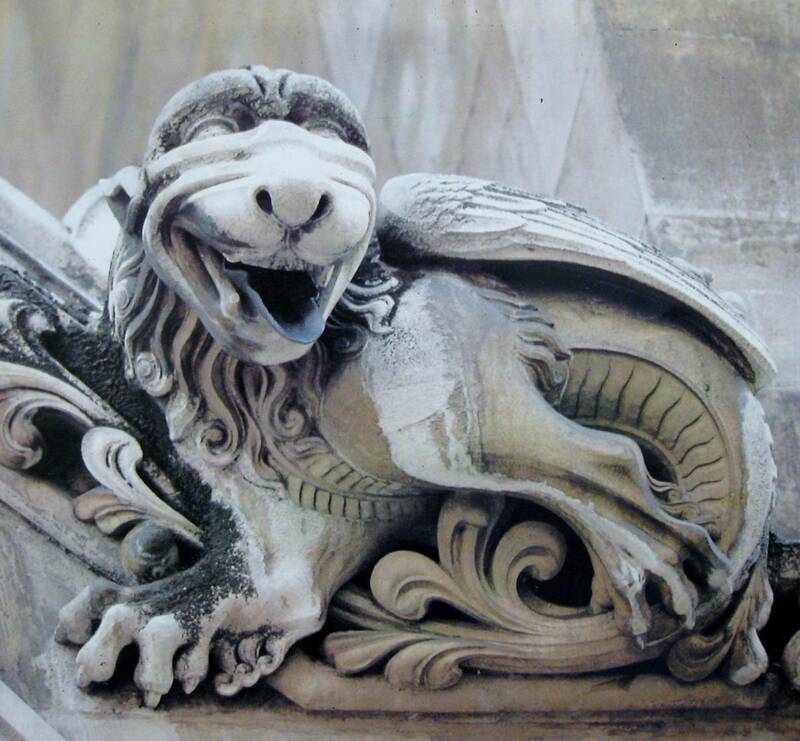 A Grotesque (grow tesk) or Chimera (pronounced ky MIHR uh or kuh MIHR uh) is a type of Gargoyle that is carved lower on a building and doesn’t have any type of a waterspout connected to it. The word Chimera means “anything that is wildly fanciful or absurd or any grotesque or imaginary creature”. A Grotesque is usually just a face but might also include the upper body and hands. Grotesques and Chimeras are sculpted decorations or ornaments added to the outside of a building but they don’t do a job the way waterspout Gargoyles do. Grotesques, Chimeras and waterspout Gargoyles look like strange animals, scary monsters or people with creepy expressions. The size of a Gargoyle varies from about 18 inches to four feet. Some Gargoyles are two-headed. Some Gargoyles are sculpted showing only their head, neck and shoulders. Some Gargoyles are complete full-round statues with entire bodies. Sometimes Gargoyles might have horns, beards or wings. ALL Gargoyles are strange looking creatures. Ugly and grotesque, Gargoyles may have once terrified anyone who came near them! WHERE DO YOU FIND A GARGOYLE? It wasn’t until the Romanesque and Gothic periods in architecture (AD 1000—1300’s) that Gargoyles began to be sculpted and erected on the tops of the great cathedrals of Christian churches in Europe. Gargoyles are almost always found on the outside of Gothic Cathedrals, especially on the corners of the towers, clinging to the highest edges, ledges and buttresses (supports). From their high perches they seem to spit, stick out their tongues, threaten and even laugh at us. Gargoyles usually aren’t found any lower than 30 feet above the ground. The very largest Gargoyles are found in the highest areas of a cathedral (probably because they can be seen well from far below) and the smaller ones are found just a little lower on the building. Gargoyles were usually carved of the same type stone the building was created with. They were usually made from some kind of sandstone or limestone reinforced with iron bars. Later, copper bars were used to reinforce them because these wouldn’t rust and stain the stone. A few Gargoyles were even sculpted from marble. Most Gargoyles were carved and sculpted by the artist on the ground, at the construction site, and lifted into place on the building after they were finished. WHAT DID PEOPLE THINK OF GARGOYLES A LONG TIME AGO? Because St. Bernard was an educated man, he could write down his opinion of these creatures. Unfortunately, most of the people of St. Bernard’s days had no education, so they couldn’t write down their opinions of gargoyles, even if they had one. Many people of St. Bernard’s days must have agreed the Gargoyles were “ridicules monstrosities”, yet no one else wrote down that opinion. More people of St. Bernard’s days must have liked these strange characters, or there wouldn’t be so many Gargoyles on the cathedrals of Europe today. WHERE DID THE IDEA OF GARGOYLES ORIGINATE? Because the artists who created the Gargoyle sculptures couldn’t read or write, they left no information about the meaning or history of these strange looking creatures. The educated people of those days (mostly the clergy of the churches) wrote nothing down about the Gargoyles either. Whoever came up with the idea of a Gargoyle, understood their meanings, knew their history, their stories and legends, or artistically sculpted them, died a long, long time ago. If any oral stories were passed down, it has been so long ago that everyone has forgotten them. There are many things we don’t know, for sure, about Gargoyles today. Many modern people might ask the same question that St. Bernard did but, unlike St. Bernard, most modern people seem to find Gargoyles extremely interesting and a little less ridiculous. Most people today think that Gargoyles once represented the struggle between good and evil. Other interpreters see Gargoyles as sort of medieval spiritual scarecrows, intended to scare away the devil. Some people say that in medieval days, the older beliefs and the legends of Pagan people were very often blended with Christian beliefs. Gargoyles may have represented stories that blended the two belief systems. Gargoyles could have represented rebel beings, forever condemned and attached to the outside of the building, never allowed inside the holy place of worship. Some people feel that the sculptors who invented Gargoyles probably just got bored with carving leaves and scrolls on buildings, so they created Gargoyles from their rich folklore and creative, artistic imaginations. There are many more theories about Gargoyles but these are the most popular. The carving and great detail involved in creating Gargoyles makes these sculptures works of art. They are “architectural art” (art found on buildings) and are sometimes very funny to look at. Today we are left with a mystery about the purpose of Gargoyles and the artists who created them. Do you have a theory to explain Gargoyles better than the ideas I told you about? This clay is WONDERFUL to work with and it looks just like real dried sand or sandstone after it has hardened. Since most of the Gargoyles were sculpted with sandstone, this seems a good medium to create a realistic sculpture of one of these goofy guys. This recipe will make about a dozen large, fist sized balls, so you need to double it for a classroom. Combine cold water and cornstarch in a large saucepan. Once mixed, turn on the heat to medium. Add sand, a little at a time, stirring constantly (so mixture does not settle to bottom of pan and burn) for 10 minutes. As mixture heats it will thicken. When it begins to boil, turn off heat and continue stirring until the mixture begins to resemble dough. Spoon mixture on a large dinner plate and spread it out to cool. Cover dough with a wet towel and let sit until cool—about 45 minutes. When cool, divide into balls and store in a plastic sandwich bag. Keep refrigerated for up to a week. Sculpt just like clay. Cathedrals are buildings for Christian worship that were first built during the medieval days. The Bishop of the area lived in the cathedral. A group of clergymen, known as “the chapter”, hired the architect to design and supervise the building construction and also controlled the money to build it with. The townsfolk also shared in building. To build a cathedral, oxen would carry heavy carts of stone to the cities, and then townsfolk would drag the stones to the building site themselves, so that they could say they had a personal part in building their cathedral. Cities rivaled each other to make their cathedral larger, higher and more beautiful than the other neighboring cities. Notre Dame Cathedral is a famous cathedral in Paris, France. It stands on a small island in the Seine River, in the center of Paris. This is one of the most famous buildings in Europe. Notre Dame in French means “Our Lady, the Virgin Mary”. The Cathedral is dedicated to the Virgin Mary who was the mother of Jesus. It was also the very first architectural “Gothic” style cathedral ever built. Many other French cathedrals are also named “Notre Dame”, including the Rheims Cathedral, in Paris. That means that all of these cathedrals are dedicated to Mary, the mother of Jesus. The construction Notre Dame Cathedral began about AD 1163 and went on until 1250. It took about 87 years to build and it still isn’t completely finished! During the French Revolution of the late 1700’s, Notre Dame was badly damaged by angry mobs. The people attacked the cathedral because they felt the church was a symbol of the monarchy (royalty) that they hated and were fighting to overthrow. Around the lower outside section of the building were High Relief Sculptures of Kings, represented in stories from the Bible. The angry mobs felt that these kings represented their French Royalty, who were very thoughtless of the poorer class of French people. After the revolution, the cathedral was only patched up in the most damaged places. Major repair work wasn’t done on the cathedral until 1845. Notre Dame Cathedral was one of the first buildings to have Flying Buttresses, or arched outside supports. These buttresses strengthen the walls so they don’t need to be quite as thick to support the tall spires. This makes it possible for large stained glass windows to let light into the building. These windows could be placed high on the building. They brought more light into the tall, domed and vaulted ceilings and made the cathedral appear a very special and sacred place. The huge round window above the main entrance of Notre Dame is a stained glass window that is called a Rose Window. It is 42 feet in diameter and made with hundreds of pieces of colored glass, glued together with lead. Many cathedrals have a “Rose Window” but Notre Dame was one of the first cathedrals to be built with one. 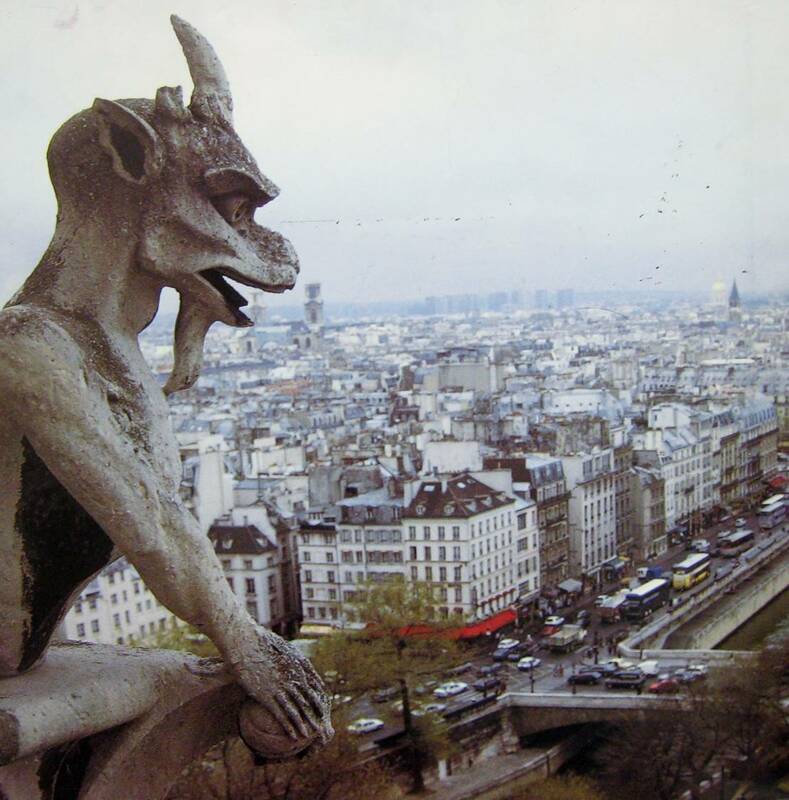 This Gargoyle leans over a corner of the Notre Dame Cathedral, high above the city of Paris. He lives on and is attached to a ledge near one of the cathedral’s Flying Buttresses. If you look closely at the top of his head, nose, shoulders and hands you can see the pollution damage this Gargoyle has suffered. The stone looks rougher in these spots because it is being eaten, or eroded away, by pollution. This guy has lost one of his horns, yet, his detailed expression and even his fingers are still very clear to see after more than eight centuries! This Gargoyle appears to be a Grotesque or Chimera (ky MIHR uh or kuh MIHR uh). Can anyone remember what is different about this type of a Gargoyle? They are carved a little lower on a building and don’t have a waterspout. This fellow looks like he is sitting on a ledge or leaning over it. He is a face with arms and hands. Doesn’t he look like he might jump down? Do you think that bump in the middle of his head is a horn or his hair? How do you think this guy is feeling? It is easy to see that this Gargoyle is a waterspout. The water runs out of his open mouth. Can you see the bottom of the spout? It looks like a tongue sticking out of his mouth. This Gargoyle has a human head with curly hair and even what looks like a hat. What type of a body does this Gargoyle have? It resembles a reptile or dragon. The feet have sharp claws. Can you see how the artist has made the Gargoyle blend in with the other decorations that are carved on the building? If you look very closely, you can even see teeth that the artist has carved on the roof of this gargoyle’s mouth. A Griffin is a mythological animal that has the head and wings of an eagle and the body and hindquarters (back legs) of a lion. The legend of the Griffin probably originated with the ancient Hittites and was a popular subject of Assyrian and Ancient Greek sculpture. This Gargoyle has been labeled a Griffin. How is it different or the same as the Griffin definition I just gave you? It has a tail and body, which look like a lizard, or even a snake. A Griffin should have a body like a lion. It has claws that look like a lion and what looks like a lion’s mane hangs down under his chin. The definition above says that a Griffin has the head of an eagle. This Griffin has a mouth that looks more like a lion than an eagle. From this angle it is hard to see what the eyes and top of his head look like. You CAN see a wing on his back, like an eagle. Can you find a waterspout on this Gargoyle? Yes, it sticks out of his mouth like a tongue. If you look carefully at the roof of the Griffin’s mouth, you can see carved teeth. These teeth are flat, more like human teeth, than sharp, pointed, lion teeth. He appears to be smiling. 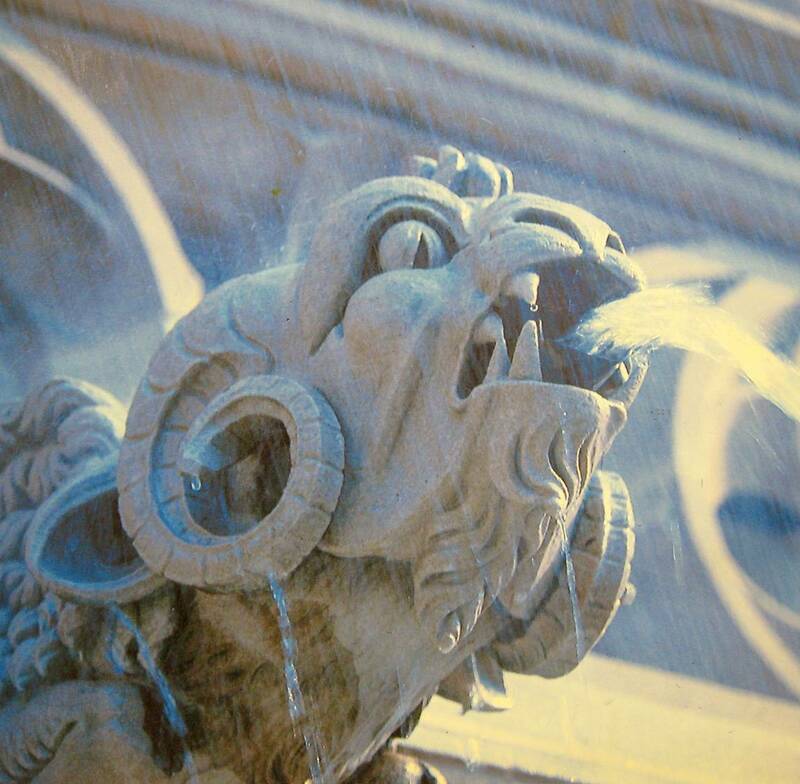 Water is rushing out of the waterspout from the mouth of the Gargoyle. He also has some pretty sharp teeth. Except for the sharp teeth and eerie eyes, this Gargoyle looks like a ram (sheep). Can you see his curly horns and his ears behind the horns? The pupil (center) of this Gargoyle’s eye is triangular instead of round, like a real sheep or a person. It looks more like the pupil of a cat or a monster. This Gargoyle is on a cathedral in the United States Capital. Since Washington D.C. was little more than farmland and wilderness some 200 years ago, we know that this gargoyle is a pretty modern creation. 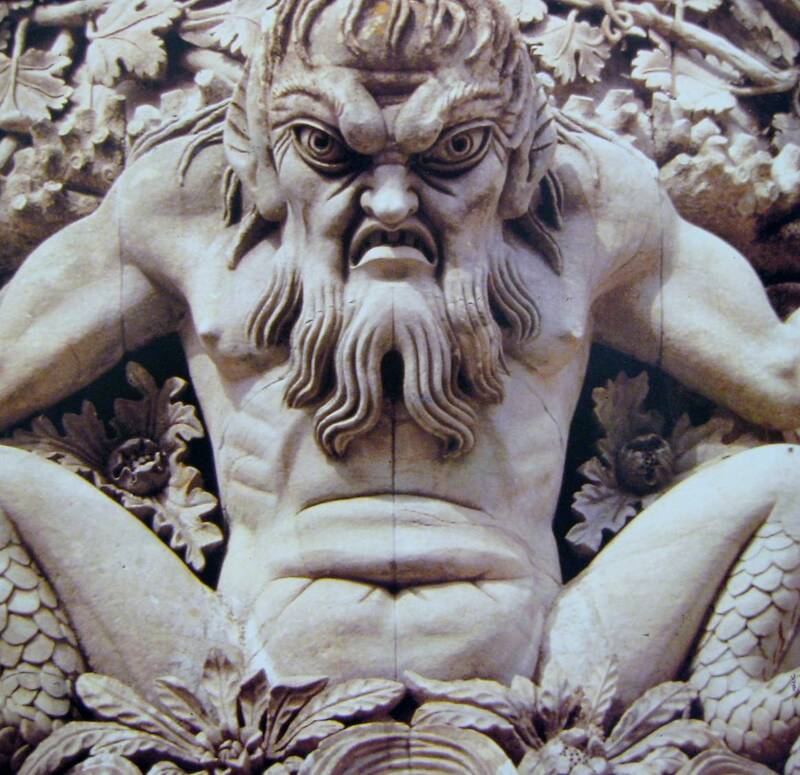 The modern artist has copied the medieval Gargoyle Style, set down hundreds of years ago. A Gargoyle like this would blend right in with ANY medieval cathedral Gargoyle. Look below the knees of this creepy looking guy. Can you see his scales? When you think of a mermaid, does she usually have legs? No, her legs are joined together to form a tail. Can anyone remember the Disney cartoon of “The Little Mermaid”? Can you remember if the Little Mermaid’s father had legs with scales (like this merman) or a tail? He had a tail instead of legs. Look at the expression on this merman’s face. What kind of mood do you think he is in? Notice the details carved on the palace wall behind the merman. Can you see the vines above and the flowers under his arms and near his legs? Notice the amount of detail the leaves, vines and flowers have. You can even see the veins on all the leaves.